2012 is fast becoming my least favourite year. It is just April and the news of death is ringing so loudly close to my ear. This time, death hit very close to home. I know he was old; over 80, he lived his life to the fullest. He lived to see his grandchildren, his first grand-daughter even got married in his life time. But the thing is no matter how old a person becomes, you never wish a day will come when you will never get to see them again. He was my aunty's husband(My mother's elder sister). He was a father to me, He is the only man, I call daddy. His words and wisdom I respect so very much. I love discussing world politics and every other intelligent discussions with him. He always loved taking us down memory lane, his experience with the British Customs and all. The love for Indian movies and particularly Nigerian movies were developed spending time with him. Baba Crown we call him, He was straightforward and was not one to mince words with you....He says it as it is and how he feel them. I will miss those moments, when I will have to chase after the newspaper guy, because baba must read the papers in the morning. Those moment when I will try to convince him to buy Punch Newspaper and he says they do not have any good story that morning. Wondering why The Tribune Newspaper was never missed. The Guardian Newspaper was a no no because their grammar was too much and never straight to the point. The way he rolls his eyes when he believes we are lying or the way his face changes when he is angry. I really was looking forward to spending some time with him, when I return to Nigeria. But as Allah will have, I will not have that pleasure. He lived well and we will miss him. Inna lillah wa inna 'ilayhi raji'un... 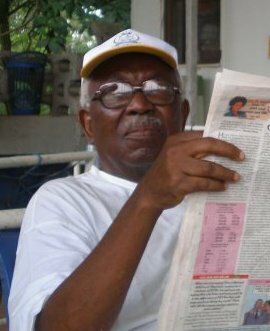 Adieu Prince Olayinka Rasak Bakre. May his gentle soul rest in the bosom of Allah. So sorry about your loss dear. Sorry about your loss. May he rest in peace. Sorry to hear this..I pray that the Lord comforts you and your family.. He sounds like a cool guy! May his soul rest in peace. Sorry to hear about your loss. It can't be an easy pain to feel or have to "accept" as you said since we all know everyone dies at some point. I pray for strength for you and your family, especially your aunt, his wife. This is a heartfelt tribute to him , Lara. I pray that God gives you and your family the strength to bear the loss. May he rest in peace. Sorry for your loss. May God grant you the fortitude to bear it. its sad when death hits close indeed. sorry about your loss, best wishes! What a handsome man he was! May his soul rest in peace, Amen.